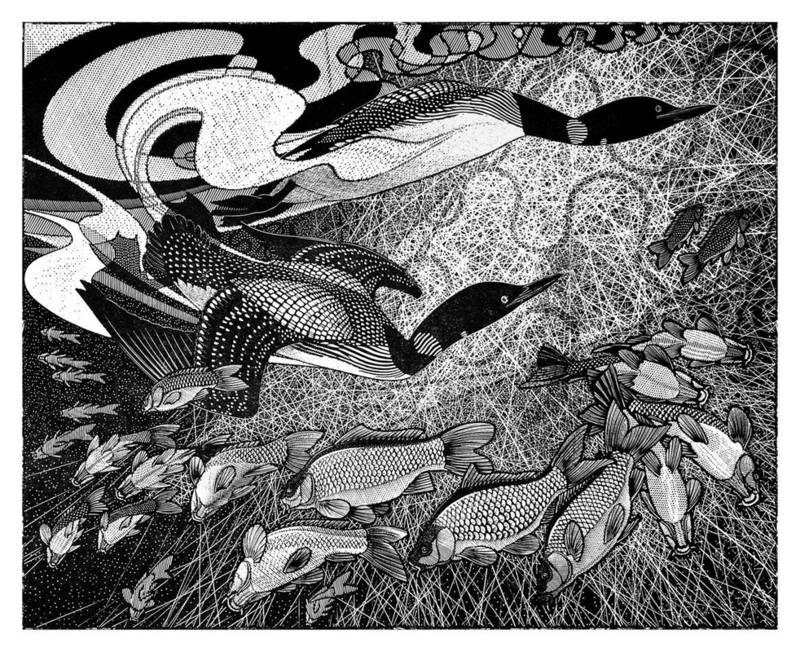 A wood engraving is a relief printmaking technique, which uses the end grain of the wood for the block, unlike that of the wood cut. It is only in English that the distinguishing between a woodcut and a wood engraving is commonly made. The traditional wood used for wood engraving is boxwood (Buxus sempervirens), alternatives are lemonwood. The wood has to be capable of coping with the finely detailed work of some engravers. The tools for wood engraving developed from those of the intaglio printmakers, the principle tool is known as a burin, a tempered steel shaft, ending in a very sharp cutting face, secured in a wooden handle. Other tools which are used are spitstickers, scorpers, tint tools and a 'multiple' tool. The image in the wood will print in reverse unlike that of the woodcut. The design is incised into the woodblock leaving the untouched, non engraved surface to receive the ink, so that the design prints 'white' against a black 'inked' background.